Bancroft Gems Gymnastics students practice their skills as part of the new weekly open gym format, offered every Saturday afternoon to members and non-members alike for a small participation fee. It has been approximately eight years since Bancroft Gems Gymnastics became an established children’s club in the region, and the club’s facility and programs have experienced significant growth over that time. Located on Highway 28 south beside the Kawartha Dairy, Bancroft Gems offers programs for children as young as 14 months of age. They have a selection of parent and tot programs that range from 45 minutes to an hour in duration. The early years activities have the aim of increasing spatial and cognitive awareness, while teaching basic gymnastic moves such as rolling, jumping and tumbling. Programs like Kinder, and Explore and Learn, cater to children up to five years of age, who may then graduate into a range of more complex programs. Some see local children following a competitive strand that takes them across the province to showcase their skills for medals. Millar is a certified Level 3 women’s gymnastics coach. She also training as a provincial judge, and is a Certified Dance Instructor as well. She holds an early childhood education diploma, and has more than 30 years experience coaching recreational and competitive gymnastics in Toronto and locally. 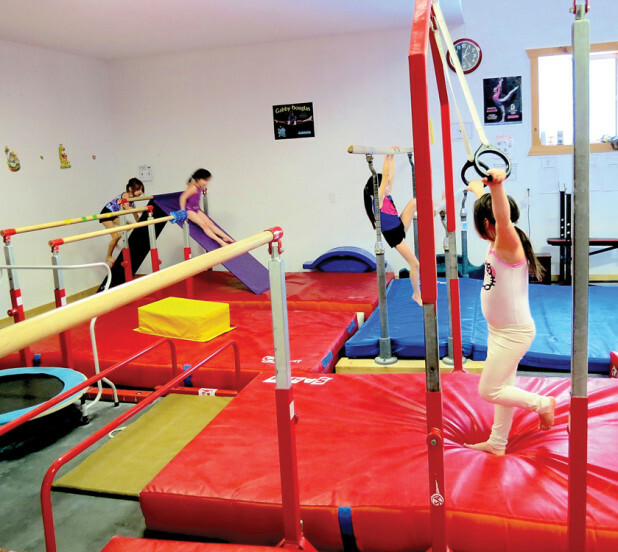 Millar’s grading program sees students working through a variety of skills on different equipment such as tumble tracks, parallel bars, ropes and beams. Skills are developed through the achievement of different skill levels, with standards based on the CanGym Badge levels. It often takes more than one term to complete certification at a given level. In order to accommodate different learning timelines, Millar also offers weekly clinics on Friday evenings, with a focus of higher level skills such as cartwheels, walkovers, and handsprings. The club also offers summer camps and weekend classes. Millar has also brought professional development to the adult recreational community in North Hastings by recruiting and training adult and adolescent athletes. Local coaches like Jennifer Boone-Gates, Tammy Woodcox, Hans Dietrich, Madison and Bronwyn-Anne Gates have obtained recreational coaching certifications under Millar’s guidance. They now work with her to advance students’ skills in a safe and nurturing way. Over the March Break, Millar has opened her club to the public by offering an “Open Gym” format to the community. This program runs daily during the March Break, from 10 a.m. to 4 p.m., allowing members and non-members to make use of the gym equipment in a safe and supervised way. After the March Break, Millar’s Open Gym format will continue on Saturdays from 1:30 to 3:30 p.m. each week.